(Chicago) Look at unit sales over $1 million in Sarasota County Florida and all appears well. Twelve-month sales equaled 128 units at March 1 versus 151 units the previous year. The 15 percent fall in sales is real, but it isn’t scary. If you want to sell your home there, you may not like the rest of the math as much. Talk to Hannerle Moore, an agent at Michael Saunders & Co. She suggests a sobering strategy. Reduce prices at least 40 percent from 2005 highs. “I tell them, ‘You could be the lady who has had her home on the market for 936 days, or you could sell,'” Moore told the Sarasota Herald Tribune (Are High-End Properties Going Down? 4/26/10). In putting together this story, I was unable to get all the data I was after on high-end inventory. I am firing shotgun to lead to something worth knowing. 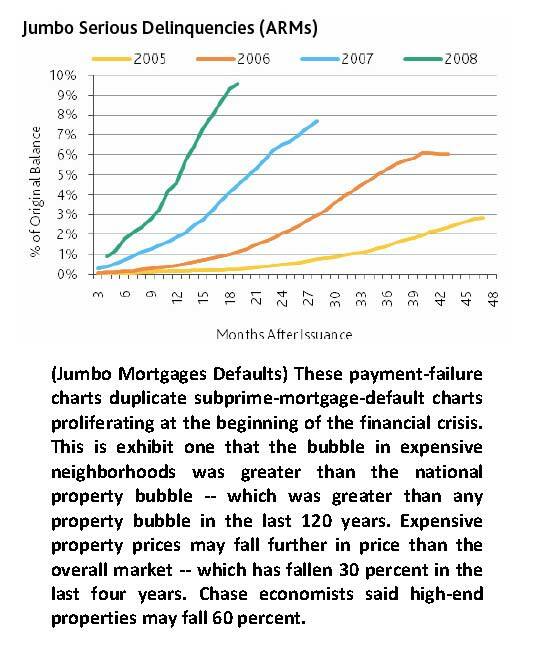 My review runs near and far in six posts starting today and includes most importantly data on the mortgage performance of jumbo mortgages. My hypothesis is that mortgage performance serves as a leading indicator of both future inventory and price trends. The worse the payment performance, the more prices will fall. Signs of serious distress on many other measures have been in open evidence for expensive properties and we will see it most clearly in jumbo mortgage performance. Consider the statement of National Association of Realtors’ chief economist Lawrence Yun. Almost exactly a year ago he said the supply of existing homes for sale over $750,000 had reached a forty-month supply (High-End Foreclosures Are Next, 5/27/09, CNBC). Translate that into something you understand: Inventory was SIX TIMES higher than it should be. Inventory is the king of the castle. We need to analyze it in guessing the direction of future prices. The high-end market is always a small presence, but also of peculiar significance — to the owners of those properties. Some stories of the log-jam in high-end property are dramatic. In Charlotte in 2009, less than 3% of all homes listed above $500,000 closed each month. In 2007, homes sales in that category closed at a 33% rate. My pigeon math says the old times were ten times better than the new times. 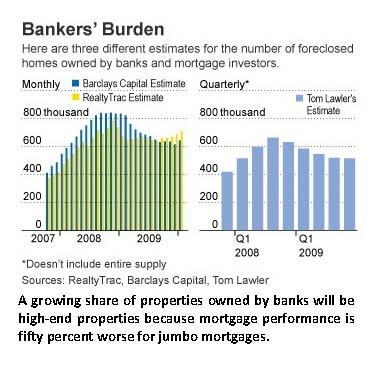 How else to describe this but as a frightening fall off (High-End home lending market has Wells Fargo on line. 4/9/10. Charlotte Business Journal)? The Wall Street Journal reported in June last year in a front page story that supply of unsold homes priced above $750,000 equaled 17 months of sales from an already high 14.5-months the previous year (I don’t know yet why Dr. Yun’s report had the supply at 40 months from a story in the same time period.). An agent from the wealthiest suburb of Chicago had an unmixed report on supply last August. “We’re extremely oversupplied,” said Sherry Molitor, a real-estate agent in Kenilworth Illinois – the boyhood home of your HousingStory.net blogger (High-End Homes Frozen Out of Budding Housing Rebound. 8/3/09. WSJ). She reports today (June 2010) that the Kenilworth market supply equals 18 months, down from 22 months a year earlier. The average selling-period is 349 days and 49 homes are listed for sale of a total of 800 households. Ms. Molitor believes values have fallen about 25 percent in Kenilworth and in the other wealthy suburbs of the North Shore of Chicago (Wilmette, Winnetka, Glencoe, Highland Park, Lake Forest). High-end Dallas also looks long in tooth. At the end of this March, listings over $500,000 provided 20 months of supply and 4500 units. Overall that market had six months of supply. This obvious indicator of high-end distress may be true in all markets across the United States. Each one is different and needs to be studied on its own, but national trends are real and must also be considered. The element of subterfuge is highest in expensive neighborhoods. You can expect ambitious concealment when a thing which requires massive sacrifice – blowing 5k or 10k out the door every month just to keep running in place — has a price falling in the wrong direction. One Russell Shaw of John Hall & Associates (self-reporting as in the top 1% of all property agents nationally) says that real estate owned by banks following a foreclosure is big business in high-end homes and the only game in town for asset managers whose work is reselling homes lost after payment failure and bank seizure. “Those high end agents are getting inventory, lots of it,” Mr. Shaw said (The Shadow Inventory Equals Shadow Gibberish. 5/8/10, AgentGenius.com). The fall in price can be wicked. If you think your digs are north of $13 million in value, take note that a Walla Walla Washington residence boasting 15,000-square-feet listed for $13 million and closed last spring for $3.5 million. Truly a Hannibal haircut (You remember the scene where one’s scalp is now outer brain – as the scalp has been neatly removed by Hannibal. So much better for your brain to take in the sun and produce vitamin D.). Beware the ghost of Patty Hearst (and headless Thompson gunners who prey upon teenage girls). Veronica Hearst, the widow of Randolph and stepmother of SLA Patty, she kicked back to the bank her 52-room oceanfront Palm Beach Florida cottage. The mortgage on it: $22 million. For the curious, the monthly payment there is $131,901 based on a rate of 6% and a 30-year amortization. Here in Chicago, the land of Lincoln and Blagojevich, big hair will take you to the governor’s mansion. On the other hand, real work over long periods of time is required to off-load either the $3-million-type inventory or the $5 million-category inventory. In Chicago’s land of horses, Lake Forest, more than 50 homes were listed for sale for at least $3 million last fall. Yet in the prior 12 months only 11 residences in that price range had sold. Typical marketing period: 500 days. Rise up to homes listed for at least $5 million and there were more than 20 Lake Forest properties for sale. Yet the 12 month-clearance on these super-fives brought only one little close. The Chicago Tribune called this a 20-year inventory (Ultra High-End Homes Slow To Sell in Crowded Market. 10/18/09). I haven’t heard of that number before, but essentially it means selling your home requires the same planning, patience, and follow up as saving for college when your newborn first arrives and carrying through all the way to graduation. So what do we know so far about the direction of inventory of expensive properties? A pro says to knock down prices 40% to list in Sarasota County. The National Association of Realtors reported a high-end supply of 40 months — or more than SIX TIMES higher than it should be. Charlotte is selling out ten times slower than in better times. Kenilworth Illinois is “extremely oversupplied”. And in Lake Forest power houses are selling, but it takes 20 years to get rid of the thing. Does anybody see a trend? I have one question for you Mrs. Lincoln: Did you love your husband? Check back later this week for Part 2 of our six part series “Accelerating Jumbo Mortgage Delinquencies Will Bash High-End Property Values”. Michael David White is a mortgage-originator. An analysis of the Greenwich, CT housing market would also be interesting.